Traveling alone for the first time? Do not worry and read the complete article for tips which you can follow. When you travel alone for the first time you have a list of things to explore and understand. When you travel alone it can be great fun when you act intelligently and in a safe manner. There are chances of meeting new people from around the world. When you travel alone for the first time you have to take care of all your belongings and you have to be a responsible person. Many people who travel alone irresponsibly have to face a bunch of problems. How to Prepare Yourself if you Travel Alone for the First Time. 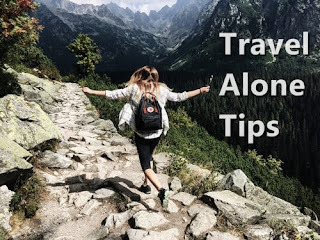 Below is the list of things you have to do when you travel alone for the first time. These things will help you to understand how to prepare for your travel and the next step would be considering your safety for travel. 1. Select your Solo Travel Destination. Note down all the destination you have a dream to travel alone and plan how many days you will be going for. Plan the travel destination and days according to your work schedule and work leave you are getting. Plan the destination according to your interests eg:- if you like historic places select a good historic country to travel, if you a party person select the destination accordingly. 2. Note Down Things you want to do After you Fix Your Travel Destination. You are a free person when you travel alone so do whatever you want and enjoy to the core. Do not spend and waste your time after reaching the destination on what you want to see. Fix well before in advance and make a list of things day wise. You have to make a day wise itinerary before you start your travel. Even if you want to go party in the night fix the schedule in advance. If you are not sure about what to do try using google and various other sites which can help you explore the place you are traveling. Read reviews of real people before fixing any places. It helps a lot to know about the place and is it your type or no. Have a wide range of exposure, read as much as you can. Even try calling the place you have fixed to go and understand about it. Many places may need advance booking so know about it by calling and directly talking to them. 3. Get the Visa and Book Your Flight in Advance when you Travel Alone for the First Time. Now when you are ready with your destination and also a plan on what you have to do when you travel alone approach an agent to get you the visa. I will personally suggest you get a visa by an agent and not try getting a visa by yourself as the visa is important and you can do a mistake while doing it yourself. Regarding flight booking, it is OK to do it by yourself. This will save you a few dollars and it is really simple to book a flight. Book flight and get a visa a month ago before your travel dates. 4. Know About the Currency and Exchange Rates for the Country you are Traveling Too. It is very important to know the exchange rates when you travel alone. This will help you to get a budget for spending. You should exchange a little amount of currency and then leave to the travel destination. It is better to carry US Dollars when you travel as it is widely accepted all over the world. If you do not carry US dollar there can be a problem of exchanging money if they do not accept your currency. For example:- If I am traveling from India to Australia, and I did not carry US dollars with me when I reach Australia and at the airport, there are chances that they won't accept Indian currency in exchange of local one. But if I have US dollars they will simply accept it fast and give me local Australian currency. It all depends on which country you are from, say suppose you are from Nigeria and traveling to Iceland. Iceland won't accept Nigerian currency in exchange but they will surely accept US dollar for local currency. 5. Book Your Accommodation in Advance when you Travel Alone for the First Time. Booking of the hotel should be done after you book your flights and you have got the visa in hand. Book hotels nearby famous areas and market, there is a chance you see an attractive deal which is cheap but the area is way far away from the actual city. Never get attracted to such travel deals and look on google maps how far is your hotel from the actual city. Now you also, have the advantage of google street view. So look for the nearby area and get an idea for the safety and cheap areas. It is recommended to stay in a good 4 or 5-star hotel rather than selecting a solo travelers hostel if you travel alone for the first time. Make your life easy and get the services you looking for in a hotel and select hotels accordingly. 6. Research About Your Travel Destination. Researching about the travel destination will help you to deal with the locals in an easy manner. This can also keep you away from potential hazards and risks. Try learning some common words in their local language. You can simply use google translate to learn some common words. Learn about their culture and the way people behave with men and women. learn about the local gestures in public. Learn about local dressing styles and select your clothes accordingly. Researching will help you to be safe and also roam in a free manner. 7. Pack Only what is Essential and Make Sure Your Bags are not Heavy. Pack your bags lightly as you have to yourself carry it when you travel. Do not carry unnecessary things and make your bag heavy, it will be tiring for you when you travel. You have to make your travel packing list and luggage which is easy to carry. c) A small first aid kit. d) Important and generic medicines for cold, fever, pain relief etc. e) Credit card for any emergency. f) Small passport size picture of you and xerox copy of all your important documents. 8. Leave an Itinerary Copy with a Trusted Friend or Family if You Travel Alone for the First Time. It is important for at least one person to know if you travel alone to your destination. Keep that person updated with your location and the thing what you do. This is important because if some mishaps happen when you travel that person will be aware of your location and can help you if anything goes wrong. Do not simply assume that your cell phone will work all the time and people will be able to know about your location and you will get instant help. There are chances that your phone do not get the signal or any kind of errors occur. It is safe to buy a local sim card when you travel alone. 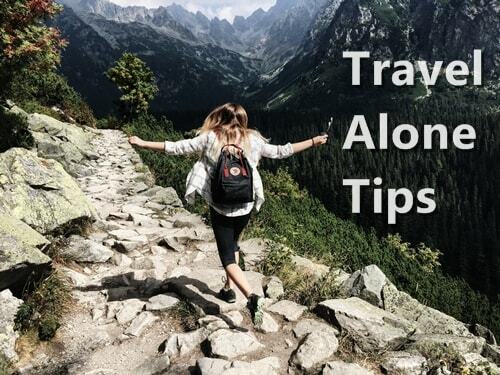 How to Stay Safe While Traveling Alone. Safety is very important when you travel alone. You should know how to behave and be smart to not get into any kind of problems. 1. Keep All Valuables in the Safe of Your Hotel. Whenever you travel around places in the country do not carry all your things together. Keep your important things like passport, visa copy, some cash and your card in the safe of your hotel. Lock the safe properly and note down the password you have set for your safe and keep it in your pocket. There are chances you might forget the password so writing it down is a good option. Do not flaunt your wealth while you travel abroad. There is no need to wear flashy jewelry and take a bundled amount of cash with you. There are more chances of fraud happening when you try to flash our wealth because you look like a tourist when you travel abroad. If you got caught up in a dangerous situation give whatever you have and simply leave from there. It is better to save your life over money. As it is you will carry only a limited amount of money when you go out and not a full bundle of dollars. 2. Do not Give Your Personal Information While Meeting New People Abroad. Be a smart traveler and lie to people if they are trying to know about your personal things. Do not tell people you meet about your travel alone to the country. Rather tell them you are meeting a friend of yours and you will stay at his or her place. No need to tell that you staying alone in a hotel. Especially for men and boys traveling alone be safe if you meet a girl abroad. If a person tries to know about your money and status of jobs etc. Do not reveal them and act as if you are a broke person. This will help you be safe from a group of people who target rich people and party or enjoy on rich person money. 3. Take the Advice of Family and Person Who has Traveled at Your Destination. In case you got stuck in some trouble ask an elderly person and take suggestions from them to about how to get out of trouble. There is a chance when a local elderly person will help you as there is less chance of an elderly person robbing you than a young street man. Local elderly persons will give you the best suggestion on what you can do and if you do not find an elderly person, trust yourself and act the way you can to get out of trouble. 4. If You Have a Gut Feeling About Something Trust it and Act the Way You Want. Do not let excitement and joy of travel overrule your common sense. If some offer by a local or some stay destination doesn't make you feel comfortable and you get a bad gut feeling of the same. React instantly to it without delay. You have to be your own judge when you travel alone for the first time. 5. Stay in Contact With Your Family at Home Every Day. It is good to be in touch at your home when you travel alone. Set a daily fixed time in the morning or in the night to call at your place and talk at least 15 min. The best time to call at home is in the night and talk about what you did the whole day. It is also good for family home members to know about you as they must be in worry that you are fine or no, what are you doing etc. 15 min per day is not a big issue to talk at home, keep this in mind. How to Make the Most of Travel. 1. Try New Things While Traveling Abroad. Don't be picky when you travel abroad rather be a social animal and explore everything possible which is new to you. Try new food and the local famous dish even if you do not have a habit to eat it. Just try rather than eating what you eat on a regular basis. Go and search for local concerts happening around or any kind of play's which is being organized by localities. There are also, many online sites to help you explore. Go hiking or join a cycle group event which can make you roam around the city on a cycle. Whatever is your interest try exploring about it and try asking your hotel reception about good events happening around. End your day with a great story or a memory to remember. 2. Make Friends Who Look Like a Tourist. It is better to make tourist friends rather than making local people your friend as locals are risky and not safe sometimes. Group of friends you make who are tourist will give you a good company and exploration to place you have traveled to. Know your common interest with the friends you make and know about events happening and plan to go out together it is good fun. 3. Do Whatever You want and Enjoy if You Travel Alone for the First Time. There are no rules that you have to follow when you travel alone. Keep a positive mind and just simply explore and you will end up with a great solo trip.